The beef industry is facing opportunity and a dilemma. Consumption of animal protein is expected to increase more than 60 percent over the next 40 years according to the UN Food and Agriculture Organization. Ruminants are a key to meeting this demand because they can convert forage to protein-rich food and make use of land not suitable for arable crops. The dilemma is ruminants are also a significant environmental problem, producing large amounts of methane from that forage consumption. There are no silver bullets to deal with methane and ammonia emissions but there is real promise for significant improvement on the horizon say Dr. Karen Beauchemin and Dr. Karen Koenig, two researchers at Agriculture and Agri-Food Canada's Lethbridge Research and Development Centre. New product. Perhaps the most dramatic methane control option is a new product in the pipeline designed specifically to manage methane production in ruminants. "Methane is lost energy and lost opportunity," says Beauchemin. "The inhibitor 3-nitrooxypropanol (NOP) is a new compound synthetized by a company out of Switzerland specifically to control methane. A feed additive, it interferes with normal digestion process reducing the ability of rumen organisms to synthesize methane, shifting methane energy to a more usable form for the animal." Research by the Lethbridge team showed adding NOP to a standard diet reduced methane production 40 percent during backgrounding and finishing of cattle. Trials have been done in commercial feedlots and it is moving into the registration channels in North America. "Obviously there are hoops to go through in registration and questions such as pricing and mode of use in the cow calf sector that would affect industry uptake, but it is a very promising emission control alternative that could be available within three to five years," says Beauchemin. New techniques. Diet manipulation is also promising. For example, increasing the nutritional digestibility of forages through early harvesting increases animal efficiency and reduces methane emissions, says Beauchemin. "We're also overfeeding protein in many cases which increases ammonia emissions," says Koenig. "For example, distillers grains, a by-product of the ethanol industry, are commonly fed in feedlots. But the nutrients are concentrated and when added to diets as an energy supplement, it often results in overfeeding protein, which increases ammonia emissions." One new area of research that may mitigate that, she says, is using plant extracts such as tannins that bind the nitrogen in the animal's gut and retain it in the manure more effectively. That retains the value as fertilizer. "There are supplements on the market with these products in them already, but we are evaluating them in terms of ammonia and methane management." New thinking. A new focus in research trials today is thinking "whole farm." A new research nutrient utilization trial in the Fraser Valley of B.C. is looking at crop production in terms of selection of crops, number of cuts, fertilization and feed quality. "We are looking at what is needed to meet the needs of the dairy cow," says Koenig. "It's a whole farm system that does not oversupply nutrients to the animal." Basically most things that improve efficiency in animal production reduce methane and ammonia production, say Beauchemin and Koenig. They emphasize that while forage does produce methane, forage is a complex system that must be considered as whole ecosystem with many positive benefits. The biggest opportunity for improvement in methane emissions is in the cow calf and backgrounding sector because they are highly forage-ration based. But the low hanging fruit and early research in emission management is focused on the feedlot and dairy sector because diets can be controlled more easily. Related scientific paper here "Effects of sustained reduction of enteric methane emissions with dietary... ."
Related article at www.meristem.com. 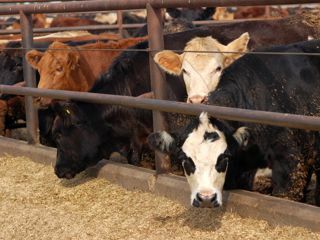 "Research leading to new information on feedlot ammonia emissions." Reprintable with credit. This article is available for reprint, with acknowledgement of the source as Meristem Land and Science, www.meristem.com. Meristem is a Calgary-based communications firm that specializes in writing about western agriculture, food and land use. More articles at www.meristem.com. © Copyright 2005 – 2019 Meristem Information Resources Ltd. – All Rights Reserved. Meristem® is a registered trademark of Meristem Information Resources Ltd. All rights reserved.